Get your napkin ready…you’re going to need it. 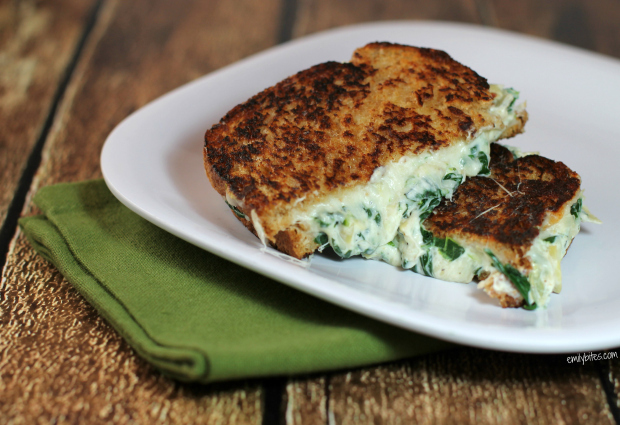 This Spinach & Artichoke Grilled Cheese positively oozes rich, creamy, cheesy spinach and artichoke dip sandwiched between slices of buttery wheat bread. It’s every bit as delicious as it sounds. Plus, the whole things together in no time and tastes decadent for just around 350 calories! You can easily double or triple this recipe as needed, and if you’re just making one sandwich, simply save half of the spinach artichoke filling for later. Cheesy, easy and delicious? That’s my kind of sandwich. Lightly mist a small skillet with cooking spray and bring over medium heat. Add the spinach and cook for about a minute. Add the minced garlic and cook for another 30 seconds to a minute until the spinach is wilted. In a mixing bowl, combine the spinach & garlic with the cream cheese, sour cream, Parmesan, ¼ cup of the Mozzarella, artichokes, black pepper and red pepper flakes. Stir until well combined. Butter one side of each piece of bread with ½ tablespoon of butter each. Place two slices butter side down on a flat skillet. Sprinkle both slices with 2 tablespoons of shredded Mozzarella each. Spread the spinach & artichoke dip from step 2 evenly over the Mozzarella layer on each slice. Sprinkle the top of each with the remaining Mozzarella (2 tablespoons each). Place the reserved slices of bread, butter side up, on top of each sandwich. Bring the skillet over medium heat and cook for about 2 ½-3 minutes until golden on the bottom. Flip the sandwiches (carefully!) and cook for another 2-3 minutes until golden on both sides. OMG this is making my mouth water!! I must try this!! I adore all of your recipes! They are all so delicious! Keep them coming!! I have fallen off of the wagon hard with my weight loss. I had lost a total of 56 lbs and have in the last 6 mos put 35 back on. I have really been down in the dumps about it but after seeing this recipe I have kind of gotten excited about getting serious and starting my journey back up starting with this sandwich. Most of the weight I lost has been from your blog and I just can not express my appreciation enough to you. My kids and husband LOVE your recipes as well. Thanks Emily! Mind blown! Can’t wait to try this one! Dana, I just wanted to leave a comment to let you know that you aren’t alone. I too lost 35 lbs and have now gained that +10lbs in the last 6 months. It’s SO depressing, but know that I’m cheering you on, and can’t wait to start trying some of these yummy recipes!! I like this recipe. It allows one to preserve more dignity than they would by simply eating a bowl of spinach and artichoke dip with a spoon, as is so tempting to do. Oh my goodness!! My husband is going to flip when I make these!! YUM!!!! I am making this this weekend! Oh wow, these look SO good! 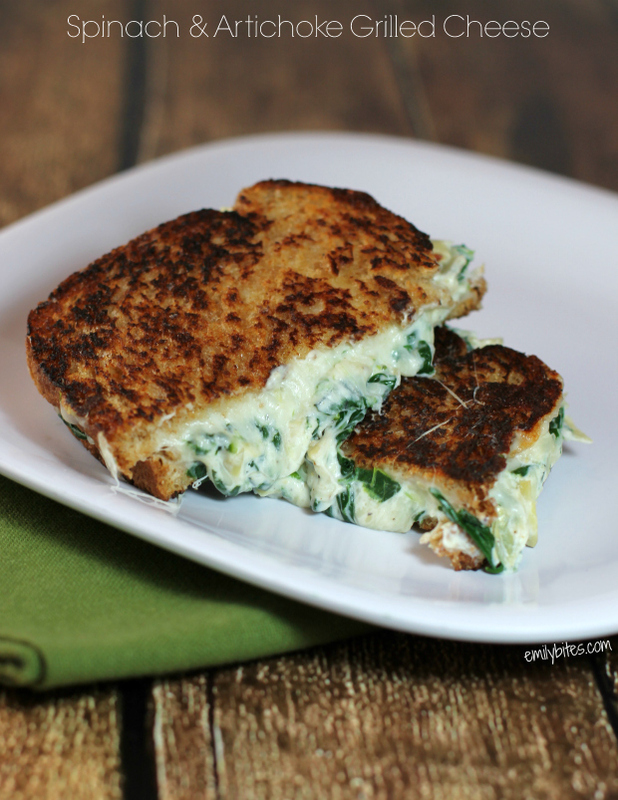 What a twist on the classic grilled cheese – or is it a twist on spinach-artichoke dip? Had these tonight- they were unbelievable!!! Thank you, so glad I found your site! Absolutely amazing recipe, it should be very nutritious too. I’m in LOVE!! I made this last night for me and my husband – seriously words can’t describe how incredible this tasted!! BEYOND a thousand thanks for this creation!! This was awesome! I love spinach and artichoke dip with chips and this was a great/healthier alternative! Very satisfying as well. Delicious! Will make again soon! Just made for dinner tonight and it is amazing!! Question: I entered in stats and WW calculator told me 9 pp….was 8 pp a typo or did the recipe builder give you 8 pp? Not a mistake! Mine came out to 8 in the recipe builder. As always, if you use different brands etc the points can vary, but it was 8 for me! I used ur stats and just entered into the calculator. No big deal…at even 9 pp…it was so delicious it was worth it!!! Gonna make these for dinner for my girl and I tonight. Thanks for the recipe! How many points was the bread that you used? Thanks so much, love your site! I made this over the weekend and I LOVED it! So good. Thanks Emily! Omg! Just had this! Delicious! This is so delicious!!! And easy, too. This is my third Emily Bites recipe this week, and my boyfriend and I have loved them all. I’m making the chicken alfredo cupcakes tomorrow and I fully expect it to be a hit, as well! Thanks, Emily!! I think this is our favorite recipe of yours yet, but honestly we love them all! The spinach and artichoke filling tastes absolutely sinful. There is so much of it too, unlike most healthy recipes. We made it without the additional mozzarella last time and didn’t even miss it. So quick and easy and tasty.